Update - review of 2015 version of play performed by Belvoir Players. The 70th anniversary of the Belfast Blitz and the death and damage inflicted by the German Luftwaffe will be remembered around Easter this year. 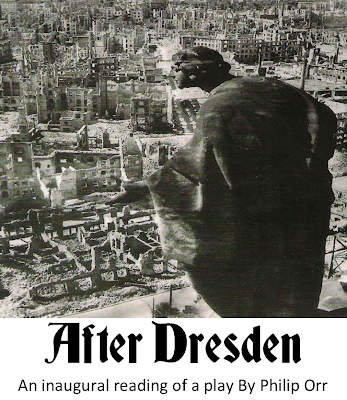 Yet later in the war, Allied air forces meted out their own mass destruction on Dresden. Philip Orr’s new play ties together wartime Dresden with post-conflict Northern Ireland, using both situations as it explores the “difficulties of reconciliation amidst a legacy of remembered hurt”. Beginning in a reconciliation community on the Irish coast soon after the paramilitary ceasefires. The inaugural reading of After Dresden takes place in Fitzroy Presbyterian Church, University Street, Belfast on Tuesday 8 March at 8pm. Admission is free and the performance is expected to last an hour and a half. Philip was my English teacher at school for two years and produced some excellent school plays, including Peter Ustinov's Romanoff and Juliet and the Sean O'Casey trilogy The Shadow of Gunman, Juno and the Paycock ("Th' whole worl's in a terrible state o' chassis") and The Plough and the Stars. In the second of his free lunchtime conversations, BBC Writer in Residence at QUB Malachi O'Doherty is talking to the Belfast Telegraph's recently appointed political editor Liam Clarke this Friday between 1 and 2pm in Blackstaff House, Great Victoria Street, Belfast. Tickets to this event may be booked in advance but will also be available from the venue on the day. Admission is on a first come, first served basis. Back to the theme of the downside of technology refresh. This time it's TiVo. Years before Sky+ and PVRs built into Freeview boxes, TiVo introduced the quantum leap beyond programming a VHS video recorder with Videoplus codes. A silver box with an analogue tuner inside, a 40Gb hard drive that could store up to 40 hours of basic quality video, and a phone connect that allowed it to dial a freephone number in the middle of the night to update its electronic programme guide. The big benefit was that you could set it to record all the episodes of a particular series rather than having to remember to programme the video each week. And there was a handy button on the remote that jumped 30 seconds forward: six clicks would bypass a normal ITV three minute ad break. Ground-breaking in its day. In the UK, the Thomson manufactured units were marketed to Sky customers starting in Autumn 2000 before Sky fell out of bed with TiVo and launched their own (rival) Sky+ box. Shortly after, online electrical retailers picked up and sold off the surplus stock. Confession: I bought two, kept one for myself, and sold the other after six months (by which time they were a bit rarer and attracted a keener price) and used the money to fund a lifetime subscription to the dial-up EPG updates. Over the last two months, various informational messages have been popping up to explain that TiVo would soon be integrated into Virgin cable boxes. And finally last week the dreaded message arrived explaining that the "lifetime subscription" service would be finishing on 1 June. Without the updated EPG, the boxes are pretty useless. Manually setting record times would be a backwards step! Along with other bloggers, I'm surprised that TiVo and Sky have kept the EPG information available for so long. 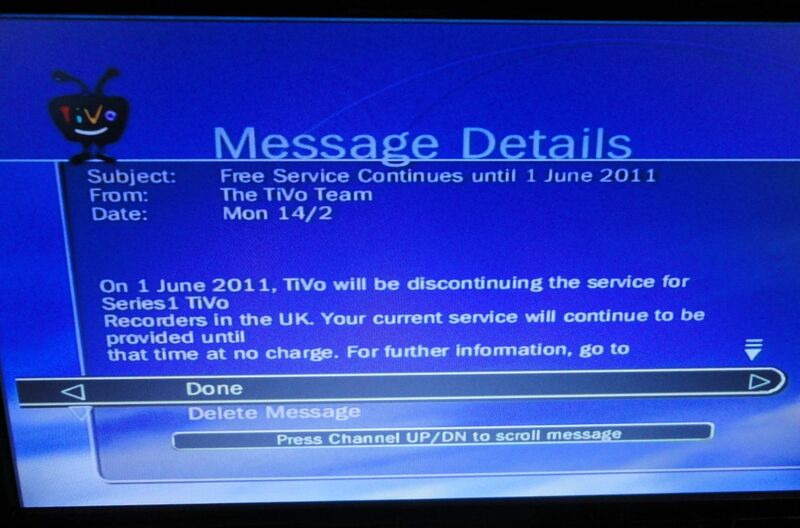 The closure of analogue terrestrial transmission in Northern Ireland towards the end of 2012 as part of the UK's digital switchover programme was always going to lead to the obsolescence of the TiVo. But Virgin's deal has hastened its demise. And with the delay in the launch of Canvas YouView - internet enabled Freeview TVs and set top boxes allowing you to roll the EPG backwards and stream old programmes on-demand - until early 2012, TiVo's withdrawal is is at least six months too soon. So after 9 years, the silver box with its original hard drive that has been spinning nearly continuously, hardly ever missing a recording. Bet its replacement consumes less power but doesn't live to its 9th birthday! Beginning in 2011, customers of Virgin Media will be able to purchase Virgin Media TV, powered by TiVo. For further product information, please see www.virginmedia.com/tivo. TiVo Series1 DVRs were manufactured for sale in the UK from 2000 to 2002 and were available exclusively to customers of BSkyB. This box has not been actively sold since this time and new accounts are not being activated. If UK Series1 customers have product or technical questions, they can receive support via email to bskyb-support@tivo.com. 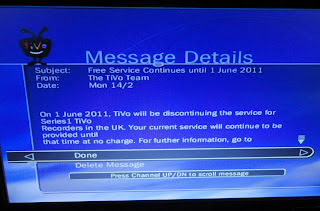 After over 10 years of operation, the UK Series1 TiVo service will be discontinued as of June 1, 2011. Since November 2010, monthly Series1 customers have not been billed and will continue to receive free service until June 1, 2011. Without the program guide data provided by the TiVo service, Series1 boxes will have limited - if any - functionality. They can still be used to view previously recorded programs and, under certain circumstances, may be used to record programs manually. The newest generation of TiVo PVR and service is now available from Virgin Media. Virgin Media is extending a special offer to current TiVo Series1 customers within a Virgin Media cabled area so that they can take advantage of the Virgin Media TV powered by TiVo. 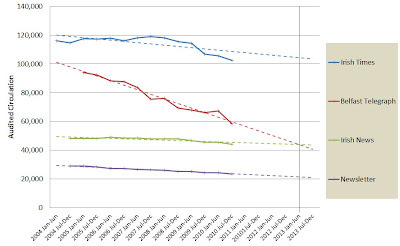 A weekend post on Slugger O'Toole about the year on year decline in the sales of the local NI daily newspapers sparked by curiosity, so I dug out* the longer term data and graphed it to show the performance (using the six monthly Audit Bureau of Circulation figures) of the Belfast Telegraph, Irish News and News Letter. I've added in the the Irish Times sales for comparison. The overall trend is one of decline. However, it is significantly more pronounced for the Belfast Telegraph. 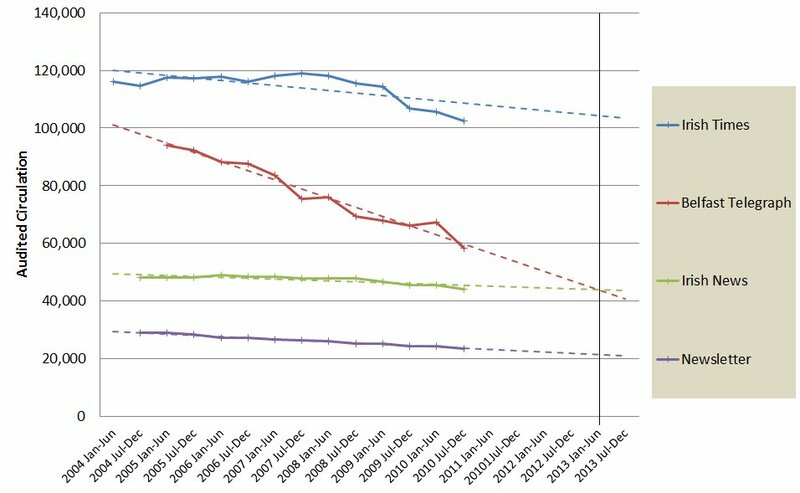 In fact if simple linear trend lines are added to the graph, sales of the Irish News and Belfast Telegraph will collide towards the end of 2012/beginning of 2013. * dug out is a euphemism for did a Google search to find different archive newspaper articles that quoted the six monthly figures as I only have access to the last set of stats on the ABC website! Working in the IT industry, you learn to be nervous of software upgrades. Whether it’s a browser, a database, an application or the whole operating system, running bleeding edge software exposes you to bugs and misbehaving features. And so it was on my Mac Mini. The Leopard version of the Mac OSX operating system had been installed for years. 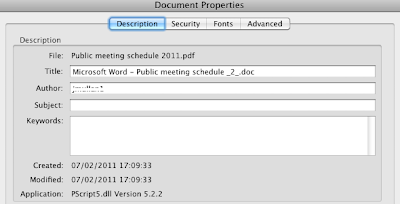 And when the next version, Snow Leopard, was released, I reckoned that the devil I knew was better than the devil I didn’t. All that risk for a predicted 10% speed increase and some new features like facial recognition in iPhoto. Why touch something that wasn’t broken? So I waited. But with the next upgrade, Lion, only months away and a double upgrade bypassing Snow Leopard unlikely to be supported … and with the new App Store available, enough time had passed. The operating system upgrade itself went smoothly. Put the DVD in, run the upgrade, reboot and there it was. Tried a few applications and they started up ok. Turns out my trusty seven year old HP Business Inkjet is no longer being supported by HP. 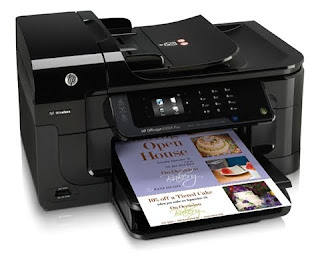 What’s the typical lifespan of a printer these days? The drivers for Leopard don’t work under Snow Leopard, and HP didn’t produce new ones. 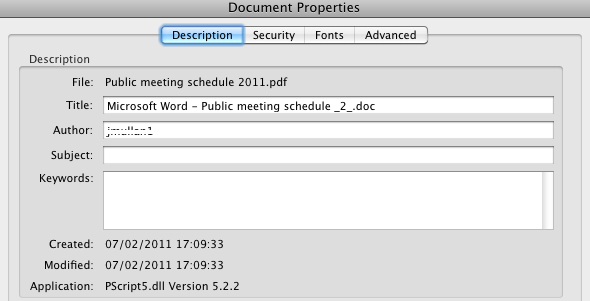 I could have found this out 18 months ago if I’d jumped to Snow Leopard early, but instead I discovered 10 days ago that I’d be on the look out for a new printer. Lucky enough I was using the last of my supply of ink cartridges, and the duplex unit has been chewing paper recently. 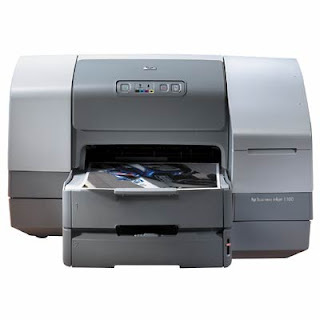 At the moment I recommend the HP Officejet 6500A Plus ... particularly it’s ability to upgrade itself over the web in less than half the time it takes to load its drivers onto the Mac! While it has a USB port, it's much more flexible to use it plugged into your broadband router. Then it's accessible by any computer at home. Just don’t try to buy it from Amazon as they won’t deliver it to Northern Ireland despite the “Free SuperSaver Delivery across the UK” on the product webpage. You can add it to your shopping basket, but when you reach the checkout, it will refuse any Northern Ireland delivery address. The Drobo NAS connected via USB seemed to be working ok until a period of sustained reading and writing (EyeTV recording programmes and then transcoding them into iTunes) when it would declare an Error -36 and promptly disconnect itself from the Mac. Under the same conditions, it worked perfectly under Leopard. But something’s changed: maybe the tolerance on the USB power. Reconnecting the Drobo via Firewire (of course, needing a FW800 to FW400 lead) has fixed the issue, though has the consequence of slowing down OSX startup. One of the main problems with RAID disk arrays is that while they can protect your data in the eventuality of a disk failure, they are often difficult for mere mortals to reconfigure when you want to add more capacity. 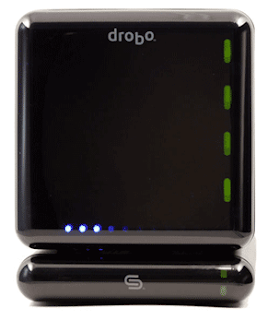 The Drobo’s unique selling point is that it allows you to pull drives out (if they’re dead or too small) and replace them with larger ones. All this drive swapping happens while the unit is running and connected to your computer. 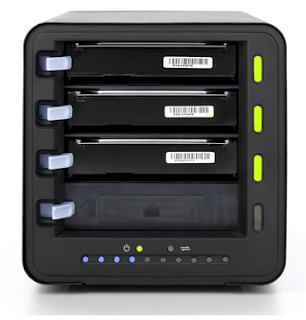 The speed of light and hard drive technology means that it still takes a long time to mirror your existing storage onto a new drive and regain redundancy – from memory 1TB took about 13 hours to replicate – but you don’t lose the use of your storage while you’re waiting. Idiot proof. The Error -36 errors somewhat dented my confidence in Drobo. Thankfully connecting by Firewire seems to have solved the problem, but I’m surprised not to find similar tales mentioning Drobo, EyeTV, USB and Error -36 on Google. The next question will be how long to wait before installing Lion. 6 months? 18 months? Certainly I’ll know to check and wait for printer drivers to become available before upgrading! I may have been the last person on the planet to see this ... but just in case I wasn't, sit back and enjoy Ronnie Corbett, Harry Enfield and this preview clip from The One Ronnie show. Back in November 2009, I posted an interview with Dawn Purvis on the blog. Since then she has left the PUP and stepped out as an independent MLA for East Belfast. If you ask me, deep down Dawn Purvis is a political anorak who could carve out a career as a party strategist or advisor. While conveniently fitting her positive self-belief about her re-election chances, I realise that her analysis and explanation of how the other parties around her in East Belfast are approaching the upcoming election (and in some cases playing into each others’ hands) is certainly more sophisticated and well-constructed than most of the commentators who get paid to write columns in the local press. But talking to Dawn earlier today, it was clear that she has no intention of becoming a part-time pundit or party advisor. Instead, she is confident that she’ll be re-elected to the Assembly in May. She suggests that four years ago “people didn’t really know who I was at the time of the last election as I didn’t really have a track record in East Belfast but I’d like to think that over the last four years my record stands on its own and I think people will see that through hard graft and sticking to my principles and what I believe that I’ve done my best to represent the people”. Her independence means that she’s “not boxed in by any party policy and can focus specifically on local issues” and have a constituency focus. She can “choose to look at big picture issues if I want but I’m not expected to be a Jacqueline of all trades and mistress of none”. Dawn highlights the continuing educational underachievement in protestant working class areas and says that the DUP and UUP have done “absolutely nothing” about the issue. Asked about her sense of where the UVF are in their journey towards non-violence Dawn simply answers “I don’t know, I’ve no idea”, refusing to speculate in more detail. Despite early promise, Dawn’s own private members bill (seeking to eliminate double jobbing between local councils and the Assembly) ran aground. Last night, John McCallister’s caravanning bill was completed and became the first private members bill to negotiate the legislative assault course since 1948. A complete session of the Assembly with no suspensions and yet only one private members bill passed seems a tad lethargic? Dawn disagrees and points to comments in the chamber last night that compared the Assembly with other UK legislatures that also have low volumes of private members bills. Earlier today - about half a mile away from Dawn’s constituency office - Tom Elliott outlined his ideas around the review of the Stormont administration and the possibilities for parties to be in opposition in 2015. Dawn recalled her advice to the SDLP and UUP after the 2007 election not to take up the three ministerial positions offered to them and to “work together with the other smaller parties in the Assembly to form a constructive opposition”. Alliance are running two candidates to pick up on any bounce from Naomi Long’s success at the Westminster elections. The DUP are a lot more confident than this time last year. The UUP haven’t quite given up - though running three candidates in East Belfast may be self destructive. And the PUP are running Brian Irvine. I asked Dawn if she felt squeezed? “No I don’t. I think it’s all to play for. I think every candidate that runs will be going after every single vote. I don’t feel squeezed. I think maybe some of the other parties need to review their strategy in light of the last four years and even in light of the last year. I think that maybe some of them are basing their strategy on figures that may not add up at an Assembly election particularly when you are running different candidates. 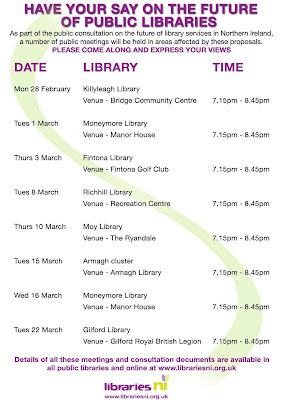 Libraries NI are nearly a third of the way through their 12 week consultation exercise for the second stage of their strategic review of public libraries in Northern Ireland. In 2010, they looked at Belfast libraries and closed ten. This year, it's libraries outside Greater Belfast with 14 proposed for closure (and 2 being merged). The last stage will look at mobile library provision. Libraries have been an ongoing theme on this blog for some years. I've very fond memories as a teenage doing a week of work experience in Lisburn library one summer. The public consultation will run for a 12 week period commencing on 10 January 2011. During that time a series of public meetings will be held and survey questionnaires will be made available. The dates, times and venues for the meetings will be published in the press and on the Libraries NI website in due course. But when I checked the Libraries NI website today, there wasn't any sign of the dates and locations on the library consultations page. And while I haven't officially heard back from an earlier emailed enquiry, the schedule of dates has magically appeared at the bottom of that page this evening. The PDF has a creation timestamp of 17:09 today ... so it looks like Library NI's definition of "due course" is "less than two days", meaning that they likely had no plan to publicise the schedule online in time for the first public meeting on Wednesday evening. Let's hope there has been adequate publicity in the local area and press ... and not just a notice stuck up on the local library doors? 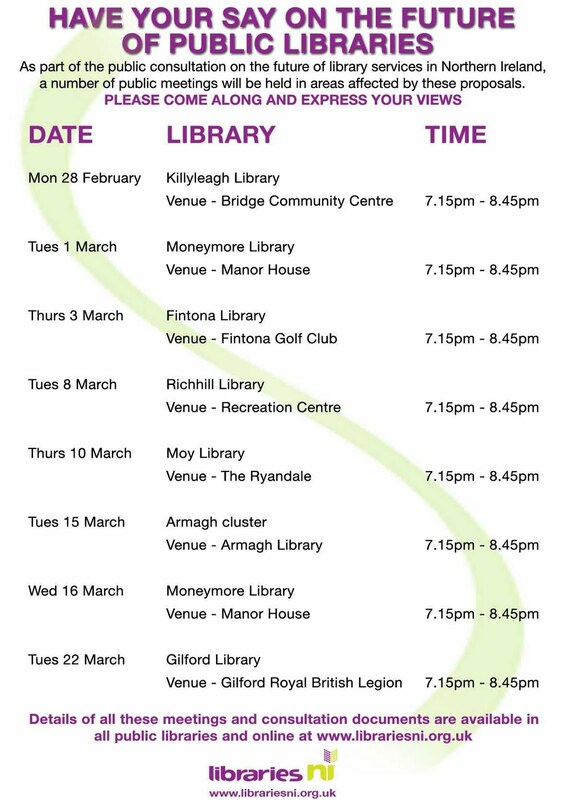 Do leave a comment below if you live near the Greystone (Antrim) or Carnlough libraries and have not heard about the public meetings. The ninety minute meetings are geared around the proposed closure of specific libraries, but are not being held in any of the affected library buildings - presumably to prevent people protesting and chaining themselves to the shelves! 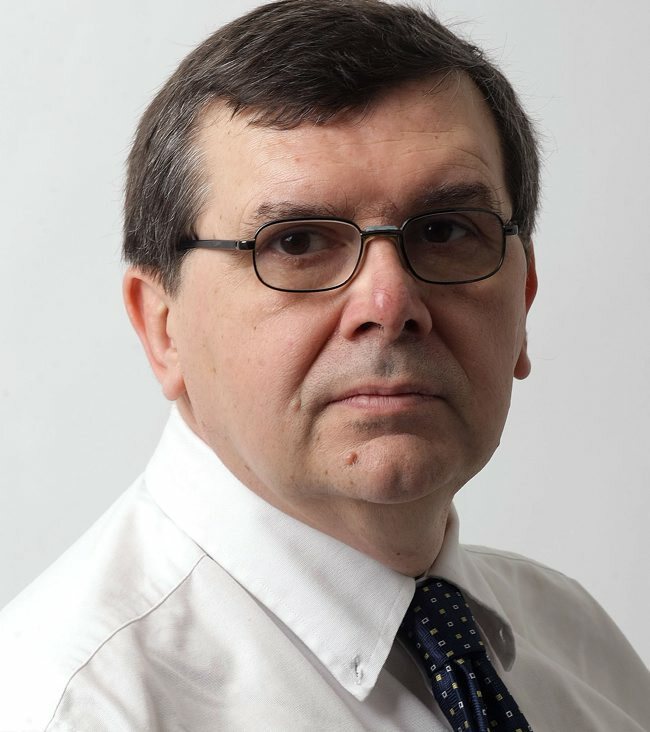 Malachi O'Doherty was appointed at the tail end of 2010 as the latest BBC Writer in Residence at Queen's University Belfast. With a journalistic background and online interests as well as being an author, Malachi has been subtly reshaping the role to expand from books to other forms of wordsmithing. Every two or three weeks, he hosts the Blog Standard group – a kind of Bloggers Anonymous – where bloggers talk about their motivation and demo their tools and techniques. Newbies and old hands equally welcome. On Friday 11 February at 1-2pm, in the first in a series of free lunchtime events Malachi will be interviewing Jim Fitzpatrick in the QUB Council Chamber in the Lanyon Building. Free places need to be booked online or by phoning 0370 901 1227. 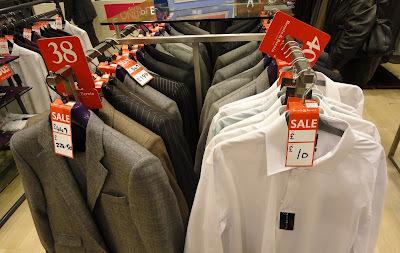 House of Fraser in Belfast's Victoria Square is not known for its bargains, but surely this must be the cheapest man's shirt ever sold in that store? The event is free and open to anyone to attend. It's not intended to be all talk from the front - participation and discussion from the floor welcomed. You’ll find Contemporary Christianity’s venue up on the 3rd floor of 21 Ormeau Avenue, Belfast, BT2 8HD. Last month’s event kicked off a healthy conversation around the room as economist Philip McDonagh looked at Northern Ireland dependency culture and the impact of political decisions (eg, freezing rates, postponing water charges etc) on the state of the Northern Ireland economy.